Brooklyn Blackout Cake. Photo courtesy The Way We Ate. Flipping through my new copy of The Way We Ate: 100 Chefs Celebrate a Century at the American Table , I came across Rachel Wharton’s recipe for Brooklyn Blackout Cake. 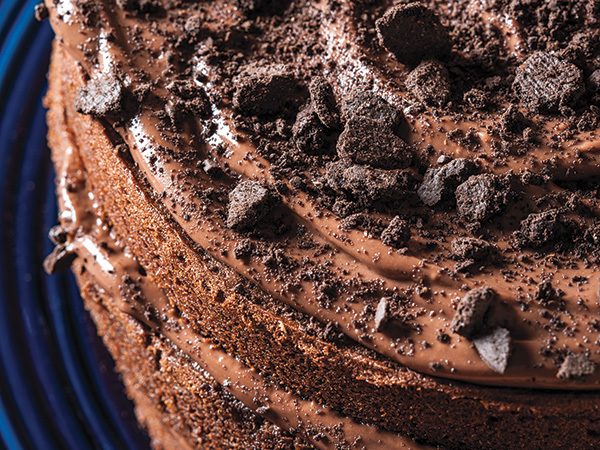 The book features a century of recipes from some of New York’s most prominent foodies; Rachel Wharton, one of the editors of Edible Manhattan and Brooklyn in one of my favorite people, and Brooklyn Blackout Cake is a double chocolate dessert that has some interesting history, leading all the way back to World War II and the Brooklyn Navy Yard. During World War II, the Brooklyn Navy Yard was one of the United State’s most important ship building yards. In its heyday, it employed 71,000 workers, including blacks, Hispanics and 5,000 women. They held managerial jobs, made equal pay as white men, and even did the same work–including women welders. Food in this era was most strongly shaped by rationing and shortages Owners of local diners had to stand in ration lines for hours to get food for their restaurants, often simply shutting down the business instead of struggling to procure food. Even the Navy Yard commissary had difficulties: fresh fruits were scarce, coffee intake was limited, and luxuries like chocolate were especially hard to find. Sugar was rationed, cacao processing plants lacked labor, and what was produced was mostly sent to the front. Chocolate was a valuable source of energy, as well as comfort, for the soldiers who were fighting. There was another chocolate confection maker in the Navy Yard area that thrived before and during WW II: Ebinger’s Bakery. The store opened in 1898 on Flushing Ave., just outside of the Yard. Ebinger’s was part of a tradition of commercial baking in the neighborhood, particularly German bakers. These shops presented an air of authenticity by hiring shop girls with German accents. Ebinger’s is most reminisced about for its chocolate cake, “with its two layers of moist chocolate cake, soft chocolate cream separating the layers, soft creamy chocolate icing, sprinkled over with crumbs of the chocolate cake itself. (source)” Cake with a crumbled cake topping is very meta. Although this cake was probably first produced in the early 20th century, it got its famous name during World War II. “Brooklyn, like the rest of the city, was subject to blackout drills,” Andrew Gustafson of Turnstile Tours told me. Turnstile offers historic tours of the Brooklyn Navy Yard. “In January 1942, a German Uboat even entered New York harbor, saw the lights of Lower Manhattan still ablaze, and used the city lights to sink two tanker ships in short order. ” Action needed to be taken to protect the American ships entering and leaving the NavyYard. Ebinger’s, being a neighbor of the Brooklyn Navy Yard, decided to name their chocolate-on-chocolate cake after the war-time events: Brooklyn Blackout Cake. Although Blackout Cake is a beloved New York City- born food, Ebinger’s filed for bankruptcy in the 1960s, and closed for good in 1972. Many feel they were victims of anti-German sentiment during and after WWII. Some fans of the cake bought one before the bakery closed and it kept it in their freezer for a year. Ever since, it feels like old school New Yorkers have been on a search to find a perfect replica of the Blackout cake. It might be one of those things that only tastes best in memory, but I don’t think it would hurt to give Rachel Wharton’s recipe a try. You can find her recipe here. Etsy Kitchen Histories: Cookie Swap! The original American Christmas cookie. Recipe here. Need to infuse a little new cookie blood into you holiday baking? Head over to Etsy, where I’ve instigated the Great Cookie Swap, encouraging users to share their favorite Christmas cookie recipes and the stories behind them. The post is infused with some of the best cookie recipes from across Etsy, and a little cookie history, too! Christmas cookies have a long tradition in the United States. The New Amsterdam Dutch who settled along the Hudson River had an annual tradition of passing out New Year’s“koekje,” which means “little cake.” The first of the year was a time to visit your neighbors and share good tidings, and it would have been unthinkable to leave without taking a caraway and orange-flavored koekje for the road. Their Anglo neighbors repeated the word as “cookie,” and an American treat was born. Go to Etsy and get inspired here!